#PRforthePlanet launches it's Earth Advocacy Service. An Instant, Nutritious, Warm Hug in a Cup. Australian Skincare Product Brings Home Editor’s Choice in 2019 Beauty Shortlist Awards… Again! Raising awareness of products, services, organisations and research on social and environmental change through the media. 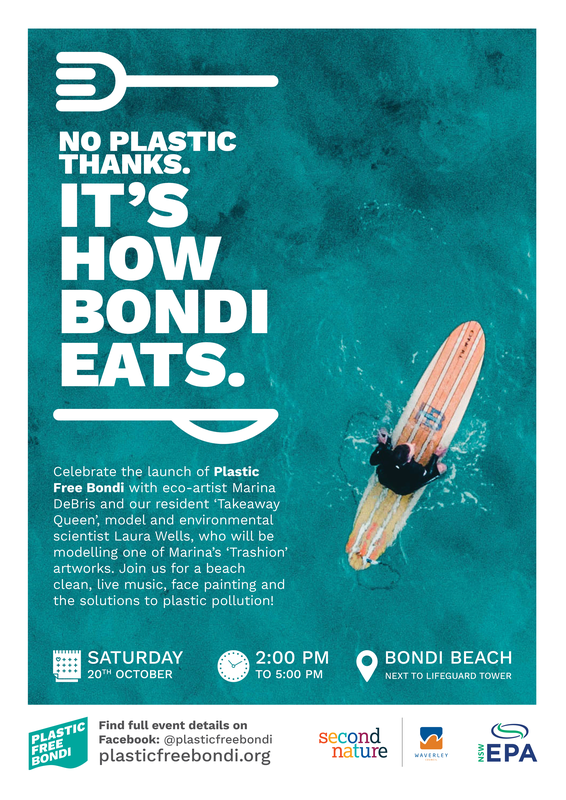 Internationally acclaimed artist Marina DeBris and marine scientist and model Laura Wells have joined forces to launch Plastic Free Bondi, a campaign that aims to reduce single-use plastic in Bondi, on Saturday 20th of October. Attendees can help eco-artist Marina Debris transform rubbish found during the event’s beach clean into a sculpture. 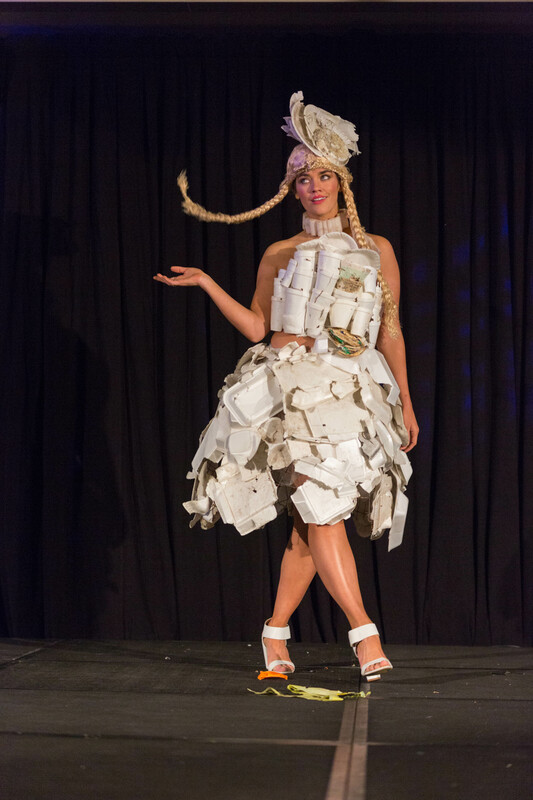 Ms Wells will be the event’s ‘Takeaway Queen’, modelling one of Ms Debris wearable artworks created entirely from discarded take-away packaging. “A lot of plastic packaging that we as individuals end up with is due to unnecessary over-packaging of food. But the answer is simple: get educated – look and shop for better choices and carry your own reusable items. It makes a huge difference to your own plastic footprint and what ends up in landfill.” said Wells. Along with cigarettes, drink containers and takeaway food packaging makes up more than 60 per cent of the litter found across Australia. Plastic Free Bondi‘s goal is to reduce single-use plastic found in the coastal area. A recent survey of local businesses conducted as part of Waverley Council’s “Bondi Unwrapped” program, showed that 90% of local cafes felt that litter adversely affects the community. Plastic free Bondi hopes to encourage businesses in the local community to transition away from single-use plastic by providing the resources, education and inspiration to do so. 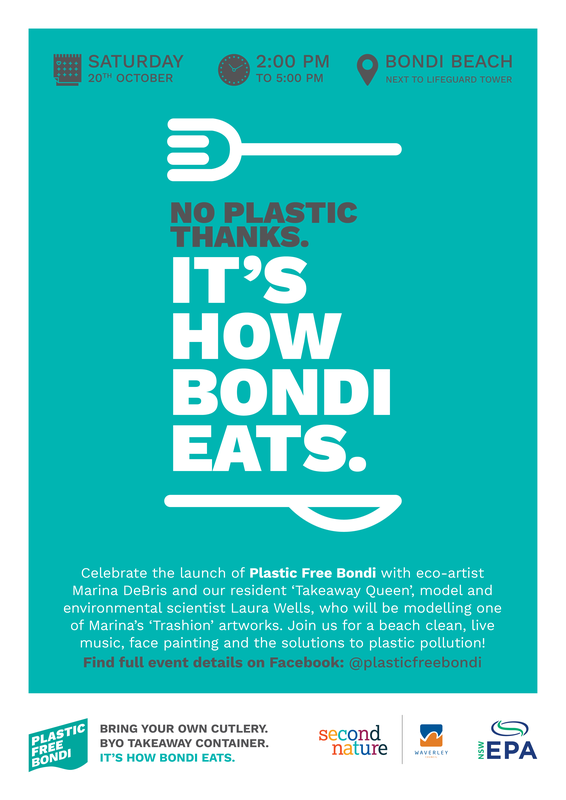 “We’re launching this campaign in Bondi because we know locals and visitors love the ocean and getting salty is an important part of our lifestyle. While we all want to protect the ocean, making the right sustainable choices can be difficult which is why Plastic Free Bondi is here to help.” Dr. Lloyd said. Plastic Free Bondi’s mission is to support Bondi residents, businesses and visitors to kick the plastic habit and in the process, inspire other communities around the world to do the same. Over summer 2018-19, Plastic Free Bondi will engage with hundreds of local cafes and restaurants to encourage them to choose sustainable alternatives to single-use packaging. Plastic Free Bondi is a community-driven movement, led by a team of locals who are committed to protecting this paradise we call home. The project is a NSW EPA Waste Less, Recycle More initiative funded from the waste levy. This project is also funded by Waverley Council.